Olympic bronze medallist, Marilyn Okoro, presented the medals to the winners of events at Wood Green Sports Day on Friday 20th July 2018. 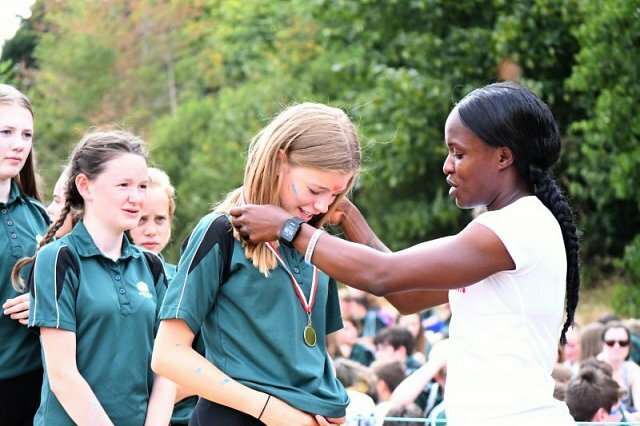 As well as presenting the medals, she took time to give short workshops to young athletes at the school about how to become a world-class athlete and mingled with the students watching the wide range of athletics events taking place. Marilyn Okoro presenting a medal to one of the event winners, Maisy Brocklebank. Jess Pickering was one of those young athletes. She said ‘I’d like to be an athlete when I’m older so it was great to find out what you have to do to compete at the top level. Marilyn was really genuine and kind, but also really honest about how hard you have to work to get to the top. I found her really inspirational’. 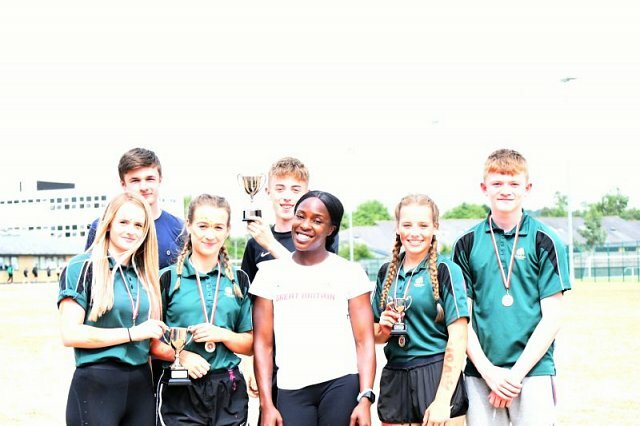 Marilyn Okoro pictured with the victorious house captains (left to right): Maddie Squire, Sam Clarke, Erin Nicholson, Jamie Christie, Chaselea Gatt and Jack Hamilton.